Please note that the content of this book primarily consists of articles available from Wikipedia or other free sources online. 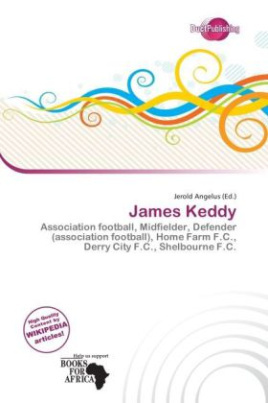 James Keddy (born March 26, 1973 in Dublin, Ireland) is a former Irish footballer who is currently managing Mount Merrion YMCA F.C.. Keddy made his League of Ireland debut for Home Farm on the 13th of October 1991. He joined UCD in 1994 and his other clubs have included Derry City, Shelbourne, Dundalk, Shamrock Rovers, Bohemians and Drogheda United. Keddy helped Shelbourne win the double of the League of Ireland and FAI Cup in 2000. Keddy received another FAI Cup winners medal as part of the Dundalk cup winning squad of 2002. He was signed by Liam Buckley for Shamrock Rovers in June 2002 and went on to make a total of 65 appearances, scoring 9 goals, in his two seasons at Rovers. This included 6 appearances in the UEFA Cup and the UEFA Intertoto Cup. Keddy rejoined former club Shelbourne on November 29, 2007.